My love of white dishes knows no bounds... Seriously. This is my dream. I LOVE white dishes too....all shapes and sizes and I have way too many to display...they are my secret prized possession! 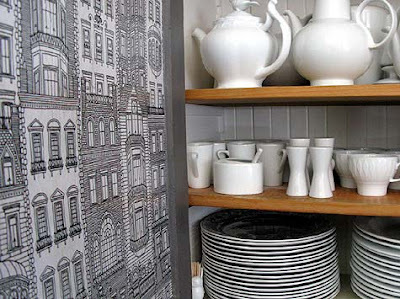 Is that building wallpaper next to the cupboard? It's the perfect touch. Have you seen pictures of Martha's prop room? I would steal from it constantly if I worked there! we seem to share the same love for white dishes. my cabinets are ridiculous. that milk glass in the bottom photo right in front makes my heart skip a beat. i love it! it's definitely my fave. a set of white dishes was the first item on my bridal registry--19 years ago! yikes. anyway...we're still using them. ditto. i adore the simplicity of all white dishes. oh gosh, these are all fabulous. white dishes are by far my favorite. so simple, elegant and refreshing! my everyday dishes are all white! i love that you can mix other dishes with them to create the mood you want. 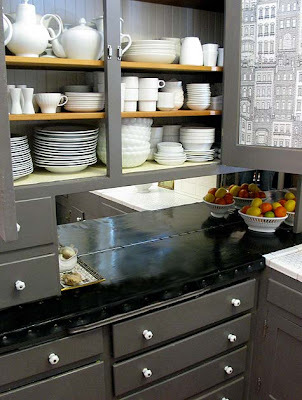 I'm a TOTAL white dishes freak - it's like black clothes, they always go together! 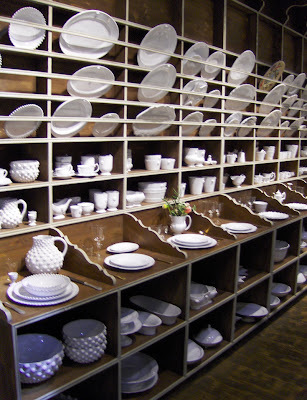 i was working on some ideas for our cabin and this posts convinced me - all white ware! thanks for the inspiration. i'm all about the white dishes too. it's the ONLY way to present food! I agree, I love the repetition.